Sometimes the economy of words Scripture employs to communicate deep theological truth is truly staggering. 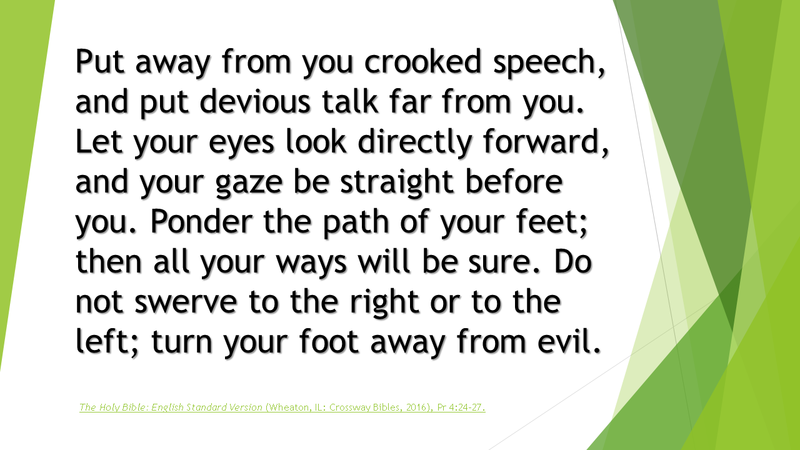 Proverbs 4:24-27 is one of those places. Let me tease out just some ideas of key importance here. First off, note that wisdom is always far more than mere knowledge. To be truly wise, one must think of things both in their full context and with their ultimate implications. So in these few verses. (vs. 24) Solomon begins by getting us to see how we need to listen to our own arguments for sin. Not to rationalize it by sly words, saying it isn’t really what it is or figuring out devious ways to tell yourself it is all right. Speak the truth to yourself, or you certainly won’t speak it to others. Do not justify straying from the path – in any way. Learn to communicate always in an honest and forthright manner. The more one speaks in devious ways, the more they obscure the lines of good and evil in their own thinking. Eventually, they grow unable to distinguish between the two and compromise runs rampant. The mind must be trained to think in clear lines of careful consideration, and not allowed to blur right and wrong. This is especially needed in prayer. Learning to be brutally honest before the Throne so that all that is wrong, all that is corrupt, all that is real in thoughts, feelings and apprehensions be brought before God so as to live in the truth at all times. He knows it all anyway. He will not be shocked or dismayed. He wants you to know what He knows so the two of you may truly walk together. (vs. 25) Always ask: Where will this take me? What is the end of what I am contemplating? In either word or deed. If you are aiming at entering heaven, keep your eyes on that destination, and make the decisions that coincide with going there. Keep looking for the door of that Great City. Keep your eyes fixed on what you intend to do and be there – and Who you are longing to spend eternity with. (vs. 26) Since the Wise Man is always asking: Where will this take me? What is the end result of this particular course or path? He is never aimless. He takes time to consider the consequences of his actions, decisions, attitudes and words. Father, make me like this. Help me always to keep the destination of Heaven and your presence before me. Let me navigate life only by this star. Note here too our responsibility not to place ourselves in the way of temptation. It is one thing to ask God to guard us from temptation – but quite another to take up our end in making the path for our own feet level. What do we subject ourselves to that is contrary to right thoughts of God? Purity? Wisdom? Promoting godliness and thoughtfulness and right thinking? If we are constantly immersing ourselves in unrighteous things, is it any wonder we stumble in them? And not because God does not guard us, but because we break through His cautions and expose ourselves to danger. Lord, deliver me from this wretched tendency in myself! So vs. 27 – Lord, keep me headed straight to the Celestial City.